Hand craftsmanship lies at the core of the aesthetic cultivated by the House of Hermès. A range of precious skills are constantly celebrated, and the objects created tell the story of the ties between hand and mind. This workmanship naturally involves leather, since Hermès has been a saddlemaker since 1837, but also silk, crystal and silver. All materials, even those of humble origins, thus find scope for full, noble and hand-crafted expression. By recreating in 2010 some of Jean-Michel Frank’s most emblematic furniture creations, Hermès was honouring the ancient art of straw marquetry, a form of expertise that has become extremely rare. Presented for the first time on a watch dial, it calls for a highly complex miniaturisation technique. The success of the extremely meticulous crafting of these dials lies in the lengthy preparations for a task implying a production technique that is different from that of furniture. Today, the rye straw used in these models is produced by only one farm in France. Longer and less knotty than its standard counterpart, it is hand reaped to ensure optimal selection of the usable parts. Mass-coloured on the spot and then laid out flat to dry, the straw which is subjected to weather conditions, variations in humidity and various baths, never displays the exact same shades of colours. Its natural colours subtly illuminate the marquetry motifs. Split open with a thin blade and then manually flattened with a bone tool, the wisps are then cut up into various lengths. This calls for accurate gestures and considerable physical strength. Playing with the colours and the directions of the various wisps, the artisan assembles his motifs on a sheet of graph paper. Glued in much the same way as a leather book binding, the straw marquetry motif is then assembled on the watch dial. To celebrate this expertise, Hermès introduces two new versions of the Arceau watch, originally created by Henri d’Origny in 1978. They feature the model’s signature asymmetrical lugs: their shape, designed as if to allow a stirrup leather to slide through it, evokes the Hermès saddle-making world. Nonetheless, the distinctive italic typeface of the Arceau hour-markers has vanished so as to give pride of place to the exceptional straw marquetry graving the dial. 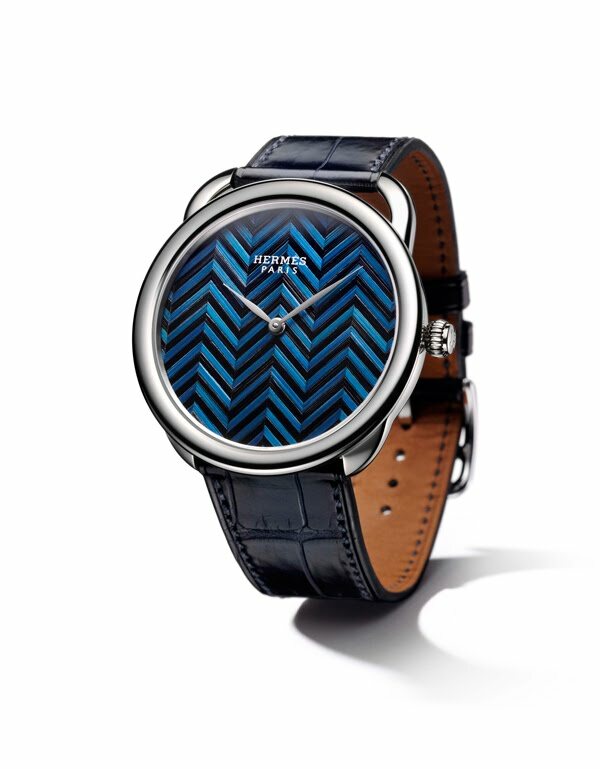 The blue and black motifs, framed by the 41 mm-diameter white gold watch case, depict two iconic Hermès tie patterns featuring chevrons and tiny squares. Equipped with mechanical self-winding movement H1928 by the Manufacture Vaucher exclusively for Hermès, these two models are endowed with a 55-hour power reserve. A matt indigo blue alligator strap matches the colours of the straw dial.